Hi, I'd like to show you this page I found on Janeen's Furniture Gallery's website. Thanks to a nifty counter-balanced linkage system, you can stop your reclining chair or sofa back at any and every angle. It's truly the best option for customizing your comfort to your body, this feature is available on both manual and power recliners. Don't be fooled by the technical jargon- Blue Steel and Dualflex springs are the real deal. The manufacturer's innovative, time-tested Blue Steel springs and the updated Dualflex system are made of heavy-duty materials and never need retying or replacing. If you don't believe it, the spring system can be replaced by the manufacturer at any time thanks to a lifetime warranty. Unlike recliners that are built with a two- or three-piece seat and leg rest cushion, this recliner has a single chaise cushion that extends from the seat to the feet. This style offers a fuller comfort and support for your legs, as well as eliminating the open gap that toddlers can get fingers or toys stuck in. Make your recliner less cumbersome by removing the back(s) when you are moving in or out of your home. Locking brackets safely join the reclining seat(s) and back(s), ensuring your recliner will be stable when you use it. There are always pieces of furniture you inexplicably remember from growing up. Usually these are special for their comfort and the memories you've shared while relaxing and enjoying the company of your family and friends. This recliner is destined to become one of those favorite pieces to everyone that gets a chance to enjoy it. A stable and durable frame construction is paired with a plush back cushion and full-support chaise leg rest. The chair gets its cozy, casual style from timeless rolled arms and button-tuft detailing. All matching reclining pieces in this collection are available with or without nailhead studs on the front arm panels, as well as the option of power or manual recline. The Mackenzi Casual Button Tufted Wall Recliner (No Nailheads) by Flexsteel at Janeen's Furniture Gallery in the Visalia, Tulare, Hanford, Porterville, Exeter area. Product availability may vary. Contact us for the most current availability on this product. Fabric Options More than 1000 fabrics to choose from – special order times and prices will vary. Comfy furniture goes a long way in making a new house or apartment feel like a home. Whether you are ready to downsize to a smaller place or settle down into your first cozy haven for a blossoming family, the Mackenzi group provides the homey, relaxing comfort that you and your family craves. 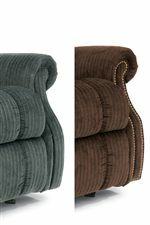 Mackenzi features timeless recliners available with or without classic nailhead stud trim. In a handy new feature for the modern, connected world, power recliners include built-in USB charging ports that are super easy to reach when you need to charge your phone or devices. The Mackenzi collection is a great option if you are looking for Casual furniture in the Visalia, Tulare, Hanford, Porterville, Exeter area. Browse other items in the Mackenzi collection from Janeen's Furniture Gallery in the Visalia, Tulare, Hanford, Porterville, Exeter area. Janeen's Furniture Gallery features a great selection of living room, bedroom, dining room, home office, entertainment, accent, furniture, and mattresses, and can help you with your home design and decorating. View recent additions to our online furniture gallery. Janeen's Furniture Gallery offers great quality furniture, at a low price to the Kingsburg, Three Rivers, Springville, Clovis, Lemoore, Dinuba, Laton, Selma, Bakersfield, Downtown Visalia, Tulare County, San Joaquin Valley area.